If you only preach forgiveness and leave judgment unto God, how do you recognize when evil has been done? This question, among many others, seems to be at the heart of Swedish director Fredrik Hillerâ€™s Psalm 21. 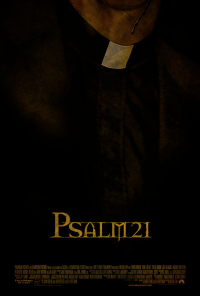 Drawing heavily on the scripture from which it takes its name, Psalm 21 is a religious thriller with a twist of horror, and a strong message. At times creepy and macabre, the film delivers an engaging and suspenseful narrative amid a dark atmosphere rich in foreboding. Though the delivery of its message hijacks the latter parts, overrunning and drowning out the horror that set it up, Psalm 21 is a deep film ripe with robust performances and deft production that easily solidify it a place among the genreâ€™s better films. The story centers on Henrik Horneus (Jonas Malmsjo), a smiling and unassuming priest in a parish made up of well-to-do worshippers that comfortably enjoy his sermonsâ€”that is with the exception of one woman who claims to be seeing â€œsouls that cannot rest,â€ including the spirit of Henrikâ€™s long-dead mother. As pragmatic as a religious man can get, Henrik dismisses the woman, but, later that night, he receives a strange call from a rural coroner. Henrikâ€™s father, Gabriel (Per Ragnar), who was also a priest, is now dead and Henrik leaves down the dark and twisting backroads of the Swedish countryside to put his fatherâ€™s affairs in order. In so doing, he begins a personal journey into the horrors surrounding his fatherâ€™s death and the mysteries that haunt the rural community. Nightmares begin to plague Henrik as he stays on the outskirts of town with a family that seems inextricably tied to Gabrielâ€™s life, preaching, and passing. The familyâ€™s son, Olle (Bjorn Bengtsson), who had been studying to be a priest under Henrikâ€™s father, proclaims that Gabriel was actually murdered and foretells that Henrikâ€™s coming has set a powerful reckoning into motion, one that promises to leave nothing unscathed. According to the movie, the Church of Sweden renounced the existence of Hell in 1983, and Henrikâ€™s father still dogmatically taught the old waysâ€”the undeniable existence of eternal damnation. Olle reports that Gabriel taught Psalm 21 in each of his daily sermons. When informed of this, Henrik mistakenly believes the psalm to begin â€œHow lovely is the Earthâ€¦,â€ a misunderstanding he must confront as he investigates his fatherâ€™s possible murder, and learns that the psalm is more about the punishment of the wicked and the unearthing of sin. Along with the allegory of the son coming to grips with the father and his legacy, the scriptural Psalm 21 serves as an inspirational outline for the film, from its subject matter and message, to the burnt faces of the spirits that come to haunt Henrik. The enigmatic language of the psalm, which is repeated several times in the film, directly relates to everything the audience, and Henrik, will experience. It is almost a roadmap for the dark and twisted roads that Henrik must traverse to escape his own living Hell and salvage his faith. Indeed, in his writing, directing, and producing debut, Fredrik Hiller has created a provocative and engrossing film. It is a tale deeply embedded with religious significance, as well as the sort of mental, spiritual, and physical journey through a personal Hell that makes for a solid horror film of the religious sub-genre. It is straightforward enough to be accessible, yet twisted and dark enough to be suspenseful. Unfortunately, it also seems to have an agenda. The deeply religious message (which I cannot fully state without ruining bits of the film) is important and relevant, especially in modern times, but is also both obvious and too convoluted. It is obvious in that the last half-hour of the film departs from the horror and promise of violence by twisting to an inspirational tale to deliver a message with a club over the head. However, the message it delivers is also convoluted in that it has obvious surface meaning, but also depths of unexplored subtlety that the characters seem to get, but that the audience is left without enough signposts to actually follow. The result is that the development in the characters, specifically Henrik, does not seem to match up with the club that Hiller has been smacking you with. However, it must be said that the film is very well put together. In production quality, it looks like anything you might expect out of Hollywood, though without all the extremely tired clichÃ©s (though it certainly retains some of them). Hiller does a fantastic job with camera angles and, when accompanied with excellent sound and music, truly succeeds in ratcheting up the tension. But the greatest success is in the potent performances. Jonas Malmsjo animates Henrik with a kind of nervous yet innocent and desperate passion that lends towards both grief and a hidden madness that is slowly emerging in his shaken faith. When coupled with Bjorn Bengtssonâ€™s zealous anger calmly tearing apart Olle from the seams, the effect is captivating. The rest of the cast, led by Niklas Falk and Gorel Crona, build the atmosphere with their suspiciousness and near stoic reserve, and Per Ragnar is just diabolical as Gabriel. But, billed as a horror movie, Psalm 21 ends up more like The Village than The Exorcistâ€”a film that uses elements of horror to deliver its message, but isnâ€™t truly a horror film. Itâ€™s creepiness and atmosphere, though rich and built up well, never quite delivers on what you want it toâ€¦the promise of violence or near inexplicable terror. The horror, while capable of making one cringe in remembrance or shudder in creeped-out splendor, takes a backseat to a message that may leave audiences slightly baffled, even somewhat clueless about what just took place in the film. With solid acting, directing, and production the movie is quite easily digestible and contains plenty of draw for fans of the genre. If you can handle a movie with a complex message, and all the twists the narrative takes to get there, then Psalm 21 is a rewarding film well worth watching.